Call it a mini book, or maybe a mega card? Whatever it is, there's room for up to 5 photos and journalling and stamping in this lovely gift for your loved one, or maybe you will turn it into a completely different theme altogether? Hope to see you in the chat room tomorrow! Ros cam over to play today and we had a nice day stamping and chatting (Josh included). 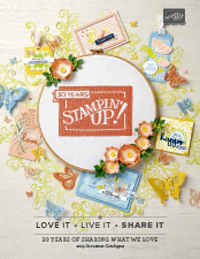 I had a chance to play with Big on Spring from the Stampin' Up! Summer Mini catalogue. It's a really versatile set and I managed to make these three cards using a few simple techniques. This first one has just been watercoloured with my Watercolour Wonder Crayons (Pretty in Pink, Rose Red and Old Olive). The Designer Series Paper is Spring Fling and the Rose Red Prints range. I've also used Pretty in Pink brads and my much missed Purely Pomegranate satin ribbon which has now retired (sadly). This second one uses the new Chunky Sprinkles Stampin' Glittercourtesy of Ros letting Josh and I have a little play with hers. I have to say how EASY this was to use and clean up and the colours are just delicious! This Celery colour is a great match for our Wild Wasabi which is the green in these lovely Spring Silhouettes Designer Series Papers (matching colours are Wild Wasabi, Soft Sky and Very Vanilla) and the Wild Wasabi striped grosgrain ribbon. The word was watercoloured using the Soft Sky Classic Inkpad. Finally I have this baby card using Paper Piecing. I have used the Spring Fling Designer Series Paper again (just love those colours of Pretty in Pink, Sage Shadow and So Saffron together). The word has been watercoloured with the Sage Shadow Watercolour Wonder Crayon and the ribbon is Very Vamilla (although a very good match for Barely Banana as well. I have also popped a couple of Pretty in Pink buttons on there too. Anita gave me a little blog challenge yesterday, and I thought it would be fun. Here's probably a good place to apologize to all the wonderful people who give me blog awards. I am sorry I am so bad at acknowledging and passing them on. The truth is it's difficult to find the time to write on my blog, and I often don't have time to post about the awards in the minutes I grab to update my blog. I am grateful though, so thankyou for thinking of me. Now back to the challenge. I had to find the 6th picture folder on my computer and then choose the 6th photo and tell the story behind it. Here's my picture which is of my husband Paul and our dog Monty. I have just got a new computer, so this was a very recent photo from our holiday at the beach. Paul has always loved German Shepherds and this is the third white one he has owned (two in the time we have been married). I also had a German Shepherd as a pet when I was growing up. Monty is a very loyal pet and looks after us all very much, while being very gentle with the boys. I always feel incredibly safe when he is around. He usually gets left behind on holidays, but this time we took him with us and he had an absolute ball. The boys particularly loved playing with him running through the water at the beach. I took lots of photos of him at the beach as well. The sad part is Monty is over 12 years old now, and late last year (a week after the cat died - go figure :( ) we found a lump on his leg that they have diagnosed as cancerous. We are watching and waiting at the moment. He seems well and energetic still, but we all know one day we will have to say goodbye to this beautiful dog which will break all of our hearts. Cambria Turnbow gave me the opportunity to have a play with some of her stamps, and this set Life is Sweet took my fancy. The colour scheme was inspired by a lovely email I had from a fellow demonstrator Janein Canada this week. Among other things she told me how she was about to paint her craft room Pale Plum and Close to Cocoa and I haven't been able to get the colour scheme out of my mind since. 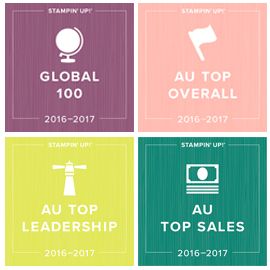 Love how quite a few of the greetings fit on the Stampin' Up! Round Tab Punch. I've also added some Dazzling Diamonds to the icing at the top. Aren't cupcakes so big in craft at the moment! I decided on a Valentines card. I couldn't locate any Green Galore, so I used Wild Wasabi instead. You know how I love my patterned papers right? Well how about if you could complete a simple 12x12 layout using just one sheet of double sided 12x12 paper and some matching cardstock? That would be 12 coordinated layouts from a pack ofStampin' Up! Designer Series Paper and some matching cardstock and embellishments. 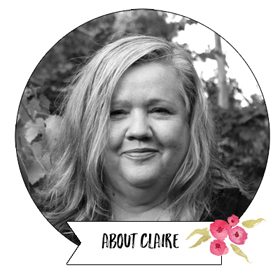 Over the next 3 or 4 months, I'll be bringing you more of these simple and quick layouts so you'll soon build up a collection of easy designs to use for scrapbooking. 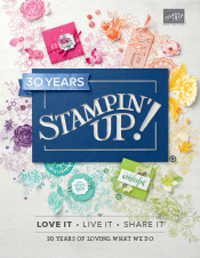 My layouts will all just use one sheet of Stampin' Up! Designer Series Paper and some matching cardstock and other stuff, whether that be stamps, buttons, ribbon or something else. I won't make promises of a certain day every week (takes the fun out of it for me :) ) but I promise to try and post them pretty regularly. The first layout features a sheet of the Spring Break Designer Series Paper and I've just used white cardstock for this one (although the matching colours are Old Olive, Pumpkin Pie, Not Quite Navy and Whisper White).